Everyone was all prepped and ready to go as we boarded the bus and ready to chrck into the airport at 9.15am. Within a minute of us boarding the bus we were notified our flight had been cancelled. There were cheers!! Once we had been allocated a hotel for the night we gave the girls the option to shop til they dropped at a mall....and they did. We finished the night with dinner as a team and all went to bed early for breakfast at 5.30am. There were many sleepy heads this morning at 5.30am breaky. We arrived at the airport, spent a long time checking in and waiting for our flight; however the girls LOVED it! More time to spend with each other and laugh...alot. Thr 12 hour flight to Singapore saw the squad make friends with another touring team for entire 12 hour flight; not a lot of sleeping occurred. Upon arrival in Singapore it was smooth sailing! The airline was waiting for our group and provided us with all the information we required. No dramas, no issues-Singapore Airlines was impecable! 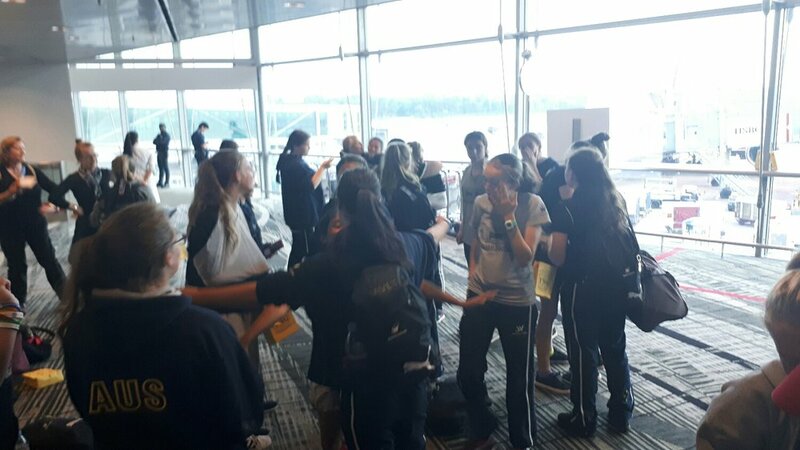 There were some extremely rushed goodbyes as some left straight away; however the majority of us were but up in the Crowne Plaza inside the International Terminal for the day as we had a 12 hour + stopover. All girls got to shower, eat plenty and sleep! Not long now and we will all be home with our families!! !